„I was just into music,“ says Joe Camilleri of his earliest days playing in bands. „That was all I was interested in. I would live it, breathe it, eat it.“ Forty-eight albums later, and his 20th – Faithful Satellite – with The Black Sorrows, and if anything he’s even more passionate than he ever was. He and longtime songwriting partner Nick Smith pretty much write every day, and ask Joe about a favourite song in his vast catalogue and he’ll tell you – the next one. Sure, he’s kicked a staggering number of goals over his 50+ years in music as a singer, songwriter, musician, performer and producer at the top of his game. As frontman of the seminal 70s band, Jo Jo Zep & The Falcons, Joe was inducted into the ARIA Hall of Fame in 2007. With The Black Sorrows, there have been hits not only in Australia but also in Europe. Touring there several times playing songs that have become radio staples like „Chained to the Wheel“, „Harley & Rose“ and „Hold On To Me“. There was an ARIA Award for Best Group in 1990, and last year their Endless Sleep album was nominated for the 2015 ARIA Award for Best Blues & Roots Album, the band’s 19th nomination. Returning for the first time in 20 years, The Black Sorrows toured Scandinavia in support of the release of Endless Sleep that reached #13 on the Euro Americana chart in 2015. There have been multi-platinum albums and, collectively, sales of over two million records worldwide. The Black Sorrows, in one form or another, haven’t stopped recording or performing since Joe pulled the thing together in 1983 – and he’s still playing 150 shows a year! His energy seems boundless, matched only by the passion and commitment with which he approaches every song, every record, every performance. Always prolific, he took the band into the studio with 30 songs from which 12 made the final cut for Faithful Satellite. And pretty much all bases are covered as the songs tumble through every kind of genre that has inspired Joe as a writer and passionate music lover himself over the years. The album is a kind of celebratory journey through the most vibrant musical styles of 20th century contemporary music and yet is always totally, unmistakably Joe Camilleri. „I’ve always cast a wide net,“ he admits, and why not? That’s what keeps things exciting after all; for the artist and for the listener. „And it’s a good rockin‘ band!“ Together, they deliver a glorious potpourri that takes in gospel, zydeco, reggae, Texas swing, old-school R&B, soul, dub, even noir -shiver in the slinky „It Ain’t Ever Gonna Happen“ – and so much more by turns, delivered in one big, sassy, sometimes brassy, always spirited package. „I’m in it for the long haul,“ is how Joe sees it, has always seen it. „I just want the future.“ And we’re all welcome to get on board and enjoy the ride. You’ll never know what’s round the next corner, but guaranteed Joe’s already had a peek and has written down a few impressions. 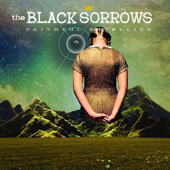 Kommentare deaktiviert für THE BLACK SORROWS return from Down Under with Faithful Satellite!